The phrase “an oasis of peace” has become a sad cliché. But there’s no better way to describe the Lan Su Chinese Garden, a walled-in island of serenity in the heart of Portland, Oregon’s Old Town. You enter, and the busyness and noise of the city streets disappear into quiet, into green, into paths and ponds and bridges. Built by Chinese artisans from the province of Suzhou, it’s an authentic depiction of a classical Chinese scholar’s garden. 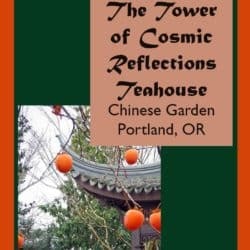 At the back is the Tower of Cosmic Reflections, which is home to a wonderful Chinese teahouse managed by Portland’s popular Tao of Tea. It’s an inviting hideaway from the city for a classic ceremonial and delicious Chinese tea service or a light lunch. Menu: Tea. Lots and lots of tea. There are so many to choose from, it can be a bit confusing if you’re not a tea connoisseur. There are white teas and green teas, oolongs, black and pu’er teas as well as herbal infusions. For lunch, there is a selection of small dishes and sweet and savory snacks, enough to put together a respectable light meal and all good for sharing. Thoughts: Let me start this by saying that if I lived near downtown Portland, I would have an annual membership to the Lan Su Chinese Garden and I’d be drinking tea and eating lunch here at least once a week. It’s not just about having a meal. It’s about the entire experience: the garden, the peace, the ceremony, the pureness of the tea, the food, the views of the garden and koi pond. Lan Su Chinese Garden was built almost 20 years ago by 65 craftsmen from Suzhou, China, Portland’s sister city. 500 tons of rock was shipped in from China, and the garden is planted with more than 400 species of plants indigenous to . Wandering the paths and patios brings you close to more than 100 trees, Chinese orchids, bamboos, and shrubs. Those who should know say it’s one of the most authentic Chinese gardens outside of China. In spring, the heady smell of gardenias wafts through the open windows of the teahouse. In winter, orange persimmons cling to the bare branches of a tree while you gaze out from the heated room. But you want to know about the tea. And the food. I found drinking tea at the Lan Su Chinese Garden teahouse, both the flavors and the ceremonious presentation, a revelation. There is a long, a very long, list of teas to choose from. The staff is extremely knowledgeable and loves and respects the tea. Choosing from a wide variety of for your service, they will pick the specific teapot or vessel to complement the individual character of your choice. If you have no idea where to start, your server will happily ask you questions about your taste and make some suggestions. They can explain the importance of picking seasons and regional weather and tell you where in China the tea comes from. You can order a regular serving of any of the offerings. For only a few dollars more, however, you can opt for the full Chinese tea ceremony, which I highly recommend, at least for your first visit. The ceremony is called “gong fu cha,” which translates as “making tea with effort or skill.” Your server will guide you through the many steps, from smelling the brick of dry tea to sipping the first steeping, all designed to both bring out the best of the tea and force you to slow down and pay attention to the color, the aroma and taste of the tea and how these change with each steeping. To be fully present to the experience of taking your tea. The pot will last through several steepings, inviting you to take your time, enjoy the tea and food, drink in the beauty of the garden outside the window. But you might also be hungry for more than a pot of tea, and the Tower of Cosmic Reflections can take care of that with great attention as well. There are snacks both sweet and savory, as well as heartier, yet still light dishes such as steamed buns, dumplings, and noodle bowls. Most dishes are vegetarian, though you can order your noodle bowl with free-range smoked turkey alongside the thin glass noodles, longevity mushrooms, and garlic sauce. The steamed buns were light and thin, with plenty of filling. A dipping sauce made of soy sauce, rice wine vinegar, and black and white sesame seeds was the right accompaniment. The small plates are perfect for sharing, so ordering a variety is a good idea if you’re not eating and sipping alone. Add a marbled tea egg, steeped in soy sauce, star anise, and pine-smoked tea or a daikon salad as a side dish. We also loved the horsebeans—lightly roasted fava beans—but were less enamored with the roasted watermelon seeds. Sweet dishes include , a pastry shell filled with sweet bean paste, lotus seed or other sweet fillings. There are almond cookies, coconut tarts, pressed plums, and candied mango slices. The space is as beautiful and peaceful as a Chinese garden requires. The two-story, 50-seat building is as classically and carefully designed as the rest of the garden, in authentic Suzhou style. Lots of dark wood, carved chairs, tall, and narrow windows with elaborately carved frames surround you. Shelves showcase many types of teapots and other serving ware, all for sale. From the bamboo placemats and wooden trays to the delicately painted scenes on the walls, every detail is perfectly chosen to add to the ambiance. Some days, students and teachers from the Wisdom Arts Academy, the Nannfang Chinese Music club, or other organizations, provide live classical Chinese music in the teahouse. The schedule is available on their website. The Tower of Cosmic Reflections does not take reservations. A couple of wines are available by the glass, as well as some sakes and non-alcoholic fruit drinks. The best seats, in my opinion, are upstairs near the window if you can get them. The whole experience is a perfect opportunity to decompress from a busy day, rest from some stressful sight-seeing, and ease into a delicious lunch and the full experience of savoring very fine tea. Price Range: Important Note: Entrance to the teahouse requires paying the entrance admission fee to the garden, $10 as of October 2018 ($7 for students, $9 for seniors). If you live in the area, consider an annual membership, which gives you a 10% discount in the teahouse. A pot of tea, beautifully presented but without the full ceremony, costs $5. The full “gong fu cha” ceremonial brewing is $8 per person. Snack prices begin at $3 for Mang Gong–blindman cookies from Guangdong—peanuts, pressed plums, etc. to $6 for Mooncakes. Steamed buns are $6, dumplings are $7; a Taoist Delight noodle bowl is $10, or $12 with smoked turkey. Side dishes are $4-5. 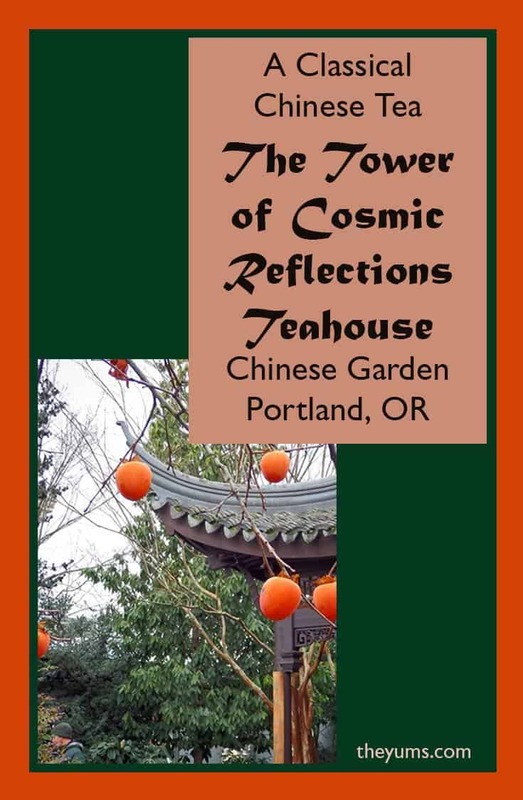 Donna – I live part time near Portland and have visited the Chinese Garden several times but have not visited the Tower of Cosmic Reflection. I certainly well based on your recommendation. I have also visited Souzhou in China! And if all this wasn’t enough, I purchase all of my tea at the Tao of Tea in Portland. I am so glad you shared your experience there.